The recent murder of a young woman in Seoul’s Gangnam district has prompted discussion about the treatment of women in South Korean society, including lingering gender inequality, harassment and even physical violence. Perhaps that concern — expressed anecdotally in media stories about the crime and the angry public response it provoked — could help explain why women and men here view the threat of crime differently. A national government survey two years ago asked about a variety of societal issues, including the “main cause” of South Koreans’ anxiety. About one in five said the chief concern was crime. But there’s a real split by gender on that question, according to the survey, released by the Korean Statistical Information Service. 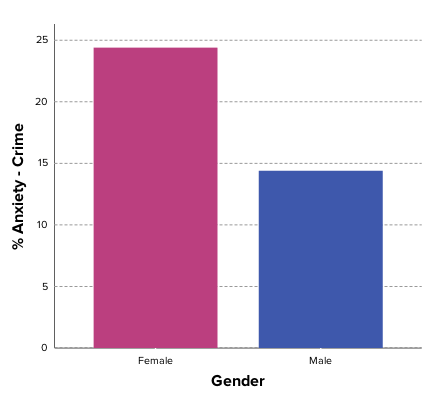 American women, it should be noted, have generally reported more anxiety about crime than men (largely because of the fear of sexual assault, which drives concern about burglary, dark alleys, etc), according to research compiled by the Department of Justice. One study asking whether Chicago residents were “afraid to go out” at night, for example, showed a similar gender split. 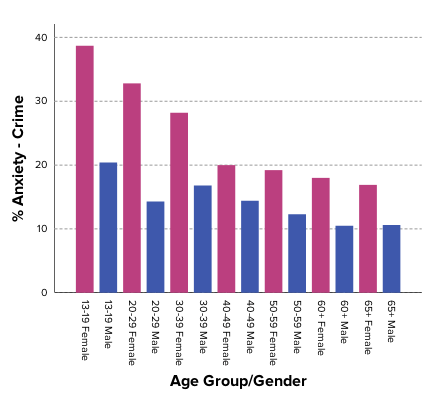 The difference on crime in South Korea is especially evident among young women, which is sad but not too surprising (school-age youths and young adults in the U.S. report the higher levels of fear of crime than other age groups, though they’re least likely to act to mitigate it).